The Library is a the perfect spot for teens aged 13 up to those in their senior year at high school to hang out, meet new people, get involved in a project or just vege out and relax. Fundraising events to get an area that’s 100% Teen, 100% of the time! Do you need community service hours to graduate distingushed? The library has an after school tutoring program for kids in 1st through 5th grade and we want YOU to be the tutor. This is the perfect way to get your 100 hours of service in and to help a kid at the same time. Tutoring and putting in your community service hours could help you get college scholarship money. Your tutoring could change your pupil’s life forever. Graduating distingushed could change yours! For more information call the library at (903) 432-4185. The Teen Advisory Board needs YOU!!! 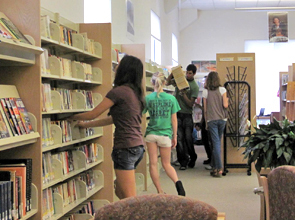 The Library at Cedar Creek Lake is looking for teens and teen groups who love libraries and are committed to helping bring library services to the community. Teens who need to perform community service to meet school, church, or organizational requirement may contact us about short-term volunteer opportunities. Teen volunteers apply their skills and talents by assisting staff in variety of duties. Their tasks are as varied as the volunteers themselves. Teen volunteers help create displays and assist with such fundamentals of library operation as organizing shelves, mending books and inventory. Volunteers work with the summer reading program and special story times for children. They also help with other special projects and events. Kids who grow up being read to and/or reading are more likely to excel at school than those who don’t. At the Library, we love to share the pleasures of reading with the young ones aged 12 and under. The library is a safe place for kids to enjoy the company of other kids. Join us every Thursday at 10:30 am for storybook reading, crafts, games and activities. Everything we do in Story Hour is aimed at getting kids interested in books and reading. 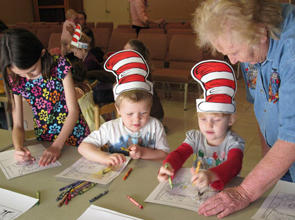 From time to time Story Hour will embrace special themes to celebrate the likes of the famous author Dr Suess’s birthday, national programs like Read Across America and Mardi Gras. Children who cannot sit without disrupting the other kids must have an adult with them during Story Hour. Check our calendar for special events. Are you struggling to teach your child? Scheduled help and academic support will be provided for kids (age 5-14) at the library where internet access and a quiet place to study are always available. If you have a prospective pupil, check the library calendar for upcoming parent-tutor interviews.